I do not ever get tired of tacos. It’s not possible. There are infinite combinations when you consider types of tortillas, fillings, cheese or no cheese, and the choice of a salsa or two. I had tacos for breakfast yesterday and will have tacos for dinner tonight. But, the tacos shown here today are special. The tortillas were homemade, the cheese was homemade, the vegetables were roasted in homemade cascabel chile oil, and they were the most delicious tacos I’ve had all year. The recipes are from Nopalito: A Mexican Kitchen , and I received a review copy. I should be clear that this book is so much more than just tacos. It’s a collection of favorite authentic Mexican dishes from Gonzalo Guzman, the chef of Nopalito restaurants in San Francisco. The recipes are true to their origin with inspiration from seasonal, local ingredients in California. Because of Guzman’s upbringing in southern Mexico in Veracruz, corn was “the king of Mexican ingredients.” And, freshly made corn tortillas are key to several dishes. The Basics chapter includes information about nixtamalization, making your own masa, and turning that into fresh tortillas. There’s also a recipe for wheat flour tortillas even though corn is preferred. Then, the chapters take you through small plates, big plates, drinks and desserts, and salsas. The Ensalada de Pepinos y Verdolagas caught my eye because it’s made with purslane and cucumbers and both are in season right now. Also, the dressing is an interesting vinaigrette thickened with pureed pepitas. There are quesadillas, tacos, and tamales with meat, fish, and vegetable fillings. And, there's a lovely looking Huarache de Huitlacoche y Hongos. I’ve never found huitlacoche available locally, but I’d love to try this with all mushrooms instead. The braised meat dishes, adobo-rubbed trout, and enchiladas would all be inviting for parties. And, I have to try the Smashed Shrimp with Eggs and Salsa served with tortillas and refried black beans and the Breaded Chicken Sandwiches on homemade cemitas or sesame rolls. The fresh, bright, and spicy flavors are evident, and I couldn’t wait to jump in and try several things. First, I made the Queso Fresco which is similar to making fresh ricotta except the curds are pressed to form a firmer cheese. There is a typo in this recipe, though, as the amount of vinegar listed is too much for the quantity of milk. The milk will over-acidify, separate, and not curdle. Rather than using the amount of vinegar listed, once the milk comes up to about 170 degrees F, turn off the heat and just dribble in a tablespoon of vinegar at a time while stirring until the milk begins to form curds. I used less than one-quarter cup of vinegar for a half gallon of milk. After curdling, the milk was left to sit for 20 minutes before the curds were drained in a cheesecloth-lined strainer. The liquid was squeezed from the cheesecloth, salt was added, and the cheese was weighted down with a bowl to press more liquid from it. It was placed in the refrigerator for eight hours. Next, I made tortillas. 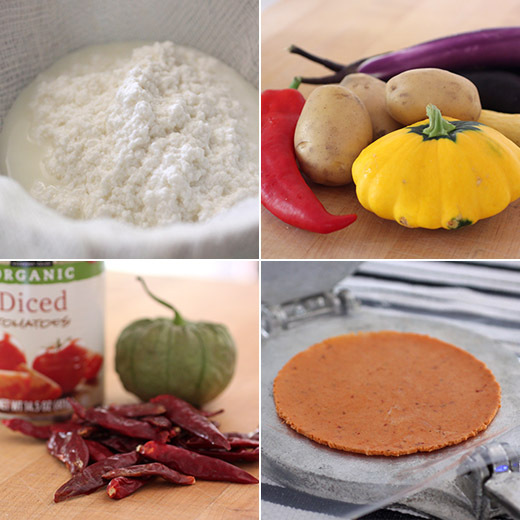 I used store-bought masa harina rather than making homemade masa, but I took inspiration from the book for adding pureed, reconstituted dried chiles to the dough. I used guajillos, and they gave the masa a pretty, orange color. Rolling balls of dough and flattening them in a tortilla press is one of the funnest things to do in the kitchen. Just be sure to line the tortilla press with pieces of plastic cut from a storage bag to prevent sticking. The pressed tortillas were cooked for a few minutes per side on a griddle and kept warm wrapped in a kitchen towel. Meanwhile, I also reconstituted some cascabel chiles that were combined with another guajillo and pureed with a clove of garlic and olive oil. That oil was used for roasting vegetables. In the book, the roasted vegetable recipe includes winter vegetables like broccoli and butternut squash, but I used the technique for summer squash, eggplant, sweet peppers, and potato. Chunks of vegetables were coated in the chile oil and seasoned with salt and pepper before roasting in a 400 degree F oven until tender and browned. One last item was the Salsa de Arbol. Dried arbol chiles were heated in a tablespoon of olive oil and then pureed in the blender with canned tomatoes, a chopped tomatillo, a clove of garlic, and some salt. All of these components came together for the freshest, most flavorful tacos. The texture and flavor of the homemade queso fresco was on another level in comparison to the store-bought variety. And, the farm-fresh vegetables roasted with chile oil were addictive all by themselves. But, wrapped in the warm, chile-flecked tortillas with the bright, tangy, and not-too-spicy salsa de arbol and dotted with chunks of queso fresco, they were divine. I’m not sure if I’ll be baking cemitas next or gathering everything for a mole sauce, but I’ll be cooking more things from this book. Might as well say you're getting tired of breathing as you are tacos. Love them! And love these -- look lovely. Sounds like a good book, too. Thanks! Those tortillas are gorgeous! 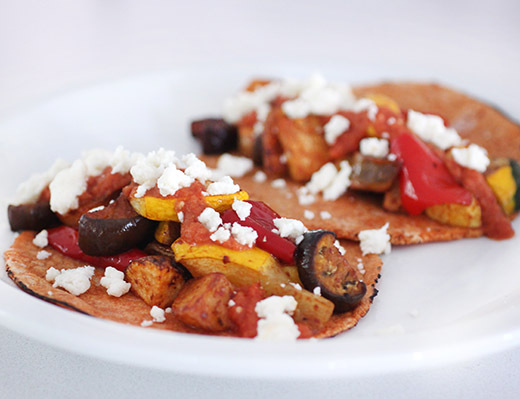 All the flavors meld together for these scrumptious tacos! We love tacos too, and I agree, there is no possibility of getting tired of them! I am beyond impressed by this paragraph: The tortillas were homemade, the cheese was homemade, the vegetables were roasted in homemade cascabel chile oil, and they were the most delicious tacos I’ve had all year. WOW, you really went the extra mile here.. great job! 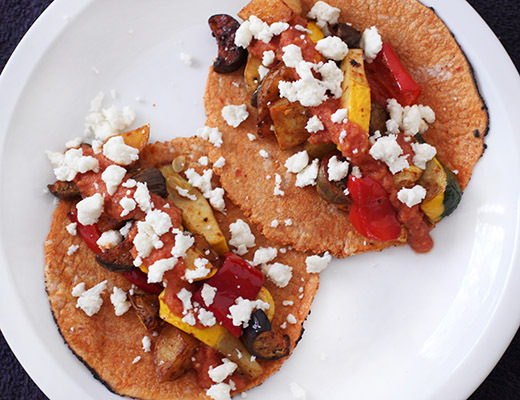 I can only imagine how amazing these taste with homemade tortillas and queso fresco. Color me impressed! Wow! how impressive making the tortillas and Queso Fresco, sounds like a fantastic cookbook, way to go!!! It's one of my fave restaurants. Such a bargain for such carefully made, soulful food. The cookbook really makes you appreciate all that goes into the dishes, too. AWESOME. i love this type of food. i can't believe it's never occurred to me to try to make queso fresco but now i really want to try! Sounds like the perfect book for Mexican food lovers or even just taco lovers. I always look for huitlacoche and never found it either. I think the restaurant owners grab it up. You made me hungry! Wow Lisa, homemade queso fresco? Amazing, and yes, I can imagine how much delicious it it as compared to the store bought...these tacos look great...so much flavors in it!